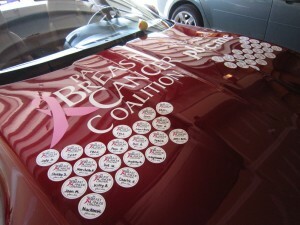 Posted By PA Breast Cancer Coalition on April 26th, 2011 at 10:12 am | 81 comments. I thought I’d continue our posts with another car-themed Grassroots Partner. Rick Stauffer, PBCC’s on-call computer tech, will begin a marathon of driving on April 28th. Rick and his friend Jim Roberts are participating in the One Lap of America series of races. Rick and Jim will be racing at several tracks across the U.S. and plan to support the PBCC through their travels. In an effort to raise awareness and donations, Rick & Jim are selling stickers that adhere to their cars. They are accepting donations in any amount, but for a minimum donation of $10 Rick & Jim will put a sticker on their cars with the name of someone you would like to honor or recognize in memory. You can also put your own name on the sticker to show your support. They plan to place as many stickers on their cars as possible including on the roof, on the roof hoop and the high part of the back window. They plan to leave the stickers on the vehicles through the competition and show season that lasts well into the fall. Be sure to check out Rick & Jim’s blog throughout the race. We’ll keep you posted on how much they raise! Go Rick & Jim! Posted By PA Breast Cancer Coalition on April 25th, 2011 at 10:51 am | 4535 comments. As with many things that happen here at the PA Breast Cancer Coalition, Peruzzi Scion approached us with an idea. Peruzzi designed a special Scion xD with pink ribbon effects across the exterior of the car plus a few other extras. Once a lucky person/family purchases the xD, Peruzzi will make a $500 donation to the PBCC in honor of the new owners. Take a look at the finished product pictured below! 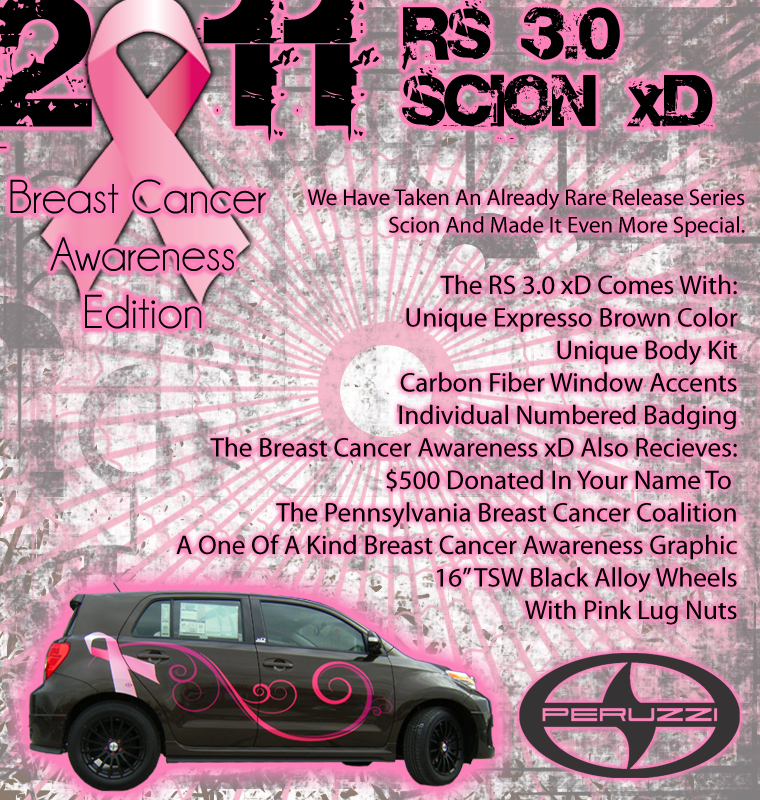 If you’re interested in the Scion xD: Breast Cancer Edition, contact Peruzzi at 877-545-2111. Posted By PA Breast Cancer Coalition on April 15th, 2011 at 9:09 am | 1026 comments. Tammy Miller is collecting your stories for her book, Pink Ribbon Stories: A Celebration of Life. Not sure what to say? Tammy or a team member will interview you and write your story. The publication is due out this Summer with proceeds going to the PBCC. What words of encouragement would you offer others? Is there anything you wish you knew before going through this? Is there anything you wish your doctor would have told you? Can you identify anything humorous that happened on this path to recovery? These specific questions do not have to be in your story, but are being offered for consideration. Submit your information to Tammy at: pinkribbonstories@tammyspeaks.com. You can send it as a Word document (1,200 word max) or in the body of an e-mail. If you need assistance with the typing/telling of your story, please let Tammy know and someone will assist you with your submission. Deadline for all submissions is June 1, 2011. All stories are subject to editing for space. Any questions, please contact Tammy at: tammy@tammyspeaks.com or call (814) 360-4031. Hey Scranton Baseball Fans! We’ve Got a Deal for You! Posted By PA Breast Cancer Coalition on April 15th, 2011 at 9:07 am | 202 comments. Are you a baseball fan in the Scranton area? Don’t miss out on this offer by the Scranton/Wilkes-Barre Yankees. We have a limited number of complimentary tickets available to the June 4 Scranton/Wilkes-Barre Yankees game. If you are interested in attending, email PBCCtickets@gmail.com with your mailing address and how many tickets you’d like. Ticket requests limited to four per person. The first 100 tickets include a buffet and seating in one of the club level party boxes. 75 tickets are also available in the lower level. Both ticket levels include a free Scranton/Wilkes-Barre Yankees baseball hat! Due to limited quantities, tickets are available on a first come, first served basis. Posted By PA Breast Cancer Coalition on April 15th, 2011 at 9:06 am | 125 comments. A favorite snack is coming back to do even more good for the PBCC! Martin’s Potato Chips is bringing its pink ribbon bags back to the shelves for a Mother’s Day promotion. Look for the special bags of the Kettle Cook’d Potato Chips in a store near you between May 2 and May 14. A portion of the proceeds from the sale of these special bags will be donated to the PBCC. Martin’s has donated over $84,000 to the PBCC through the sale of the pink ribbon bags of their most popular product, the Kettle Cook’d Potato Chips. The company was recognized as a 2010 Pink Ribbon Award recipient last year at the PA Breast Cancer Coalition Annual Conference. We are thankful for all their continued efforts! Posted By PA Breast Cancer Coalition on April 15th, 2011 at 9:05 am | 320 comments. The PA Health Law Project is a statewide center devoted to helping low income, elderly, and disabled Pennsylvanians access quality health care. If you are having trouble applying for Medical Assistance (MA), the Children’s Health Insurance Program (CHIP), or if there are no health care providers in your health plan who can meet your needs, contact the PA Health Law Project to learn how they can assist you. PHLP’s team of 8 attorneys, 3 paralegals, a physician and a social worker help thousands of people each year. They answer questions, provide advice, negotiate agreements, and represent clients at administrative hearings and in court. PHLP services are free to qualified individuals. The PA Health Law Project has participated in the PBCC’s seminars about the Commonwealth of PA’s Breast and Cervical Cancer Prevention and Treatment program (BCCPT) across the state and at our annual conferences. Their expertise about accessing quality health care is invaluable. If you or someone you know needs help, contact the PA Health Law Project helpline at 1-800-274-3258 or visit www.phlp.org. Posted By PA Breast Cancer Coalition on April 15th, 2011 at 9:04 am | 120 comments. Breast cancer survivor and PA Breast Cancer Coalition friend and volunteer Connie Dunklebarger had a recipe for fundraising success when she compiled and sold her cookbook, I Want That Recipe, to raise money for research. She cooked up a $10,481 donation to present to the PBCC along with her husband, Ed Dunklebarger, President and Vice Chairman of Susquehanna Bancshares, Inc.
Connie shared her breast cancer journey for a Survivor Spotlight feature in a previous issue of the PBCC’s print newsletter, FrontLine. She is also an accomplished singer who has performed the National Anthem at the WBCA Pink Zone at Penn State, which benefits the PBCC in part. Special thanks to Connie for her continued valuable support of the PBCC! Knock It Out of the Park in July, We’ll See You in October! Posted By PA Breast Cancer Coalition on April 15th, 2011 at 9:03 am | 108 comments. It’s not just the weather heating up! Excitement surrounding the Take a Swing Against Breast Cancer Home Run Derby is at a fever pitch with the first crack of the bat just under 3 months away. While the dates are set, the lineup isn’t –so won’t you join us this July as a batter, sponsor, volunteer or spectator? With 11 dates set at locations across the state, there’s bound to be an opportunity to get involved near you. As a special bonus, if you are one of the first eleven teams to register before the end of April, you get two free registrations for our Annual Conference in October! What a great way to see firsthand the strength and courage of breast cancer survivors and the commitment of advocates. Use the registrations for members of your team or for the breast cancer survivor or advocate in your life that inspired you to step up to the plate and take a swing!